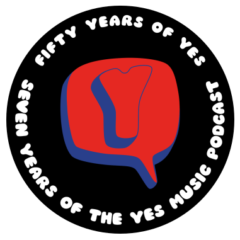 The sixty-eighth episode of the Yes Music Podcast featuring the programmes I have collected from Yes shows. Listen and see if you have any similar Yes programmes then let me know by contacting me via any of the different routes on the right hand side or by leaving a comment below! What can we learn about the state of the band at the time from the programmes? Are all programmes created equal? What makes for a satisfying Yes programme? What Yes memorabilia do you have on your desk? It’s from the Birmingham ICC concert of the Full Circle Tour, 2003. Author KevinPosted on September 29, 2011 Categories Blog postsTags 2003, Full Circle Tour, memorabiliaLeave a comment on What Yes memorabilia do you have on your desk?